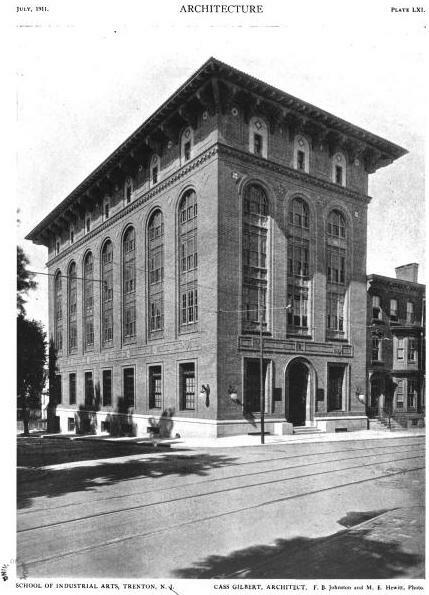 The Kelsey Building designed by Cass Gilbert c. 1910 on Barrack St. in Trenton, New Jersey. Donated to the School of Industrial Arts by Henry C. Kelsey as a memorial to his wife, the building is now part of Thomas Edison State College. Click HERE for more on the Kelsey Building. Click HERE to see the building on google street view. Photo from Architecture, 1911. This is a very interesting design. What? Somebody using the word talented and Gilbert in the same sentence? lol. Oh its Cass Gilbert...well yes, by virtue of the Woolworth Building and the New York Custom House alone, he should be enshrined in the Architectural Hall of Fame. Agree with DED.